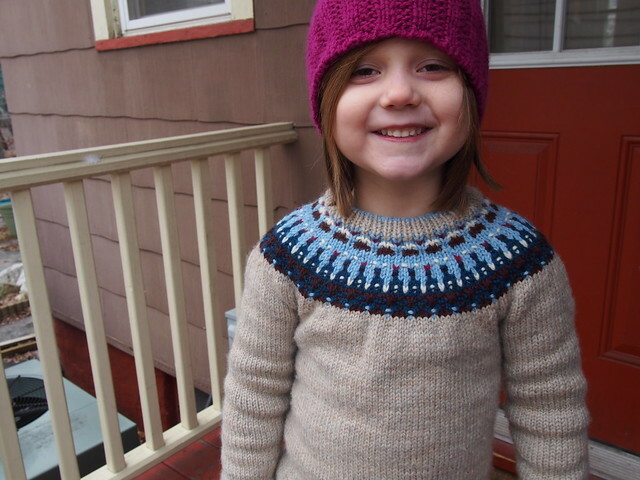 things I knit for Maddy: mini-bohus yoke sweater! 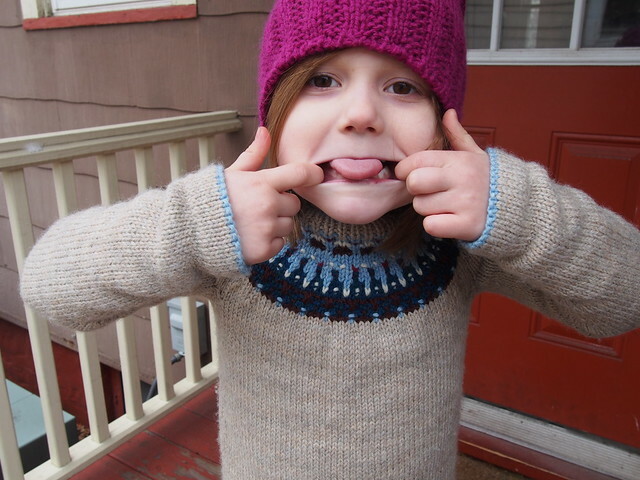 The first of hopefully many yoked sweaters to be knit this year turned out to be for M, not me! 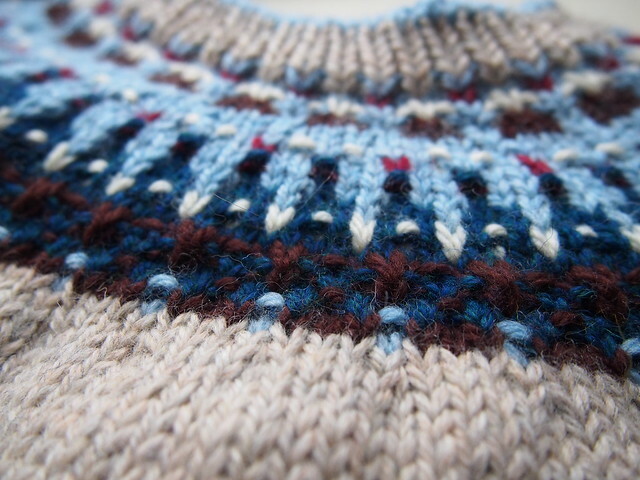 Yarn: Patons Classic Merino Wool, in “Natural Mix” and various shades of blue, white, red, and brown. Needles: size 6 for inside of hems, size 7 for the rest. Time to knit: Ridiculously long, but it sat in a bin for about 6 of the 8 months it was in progress! 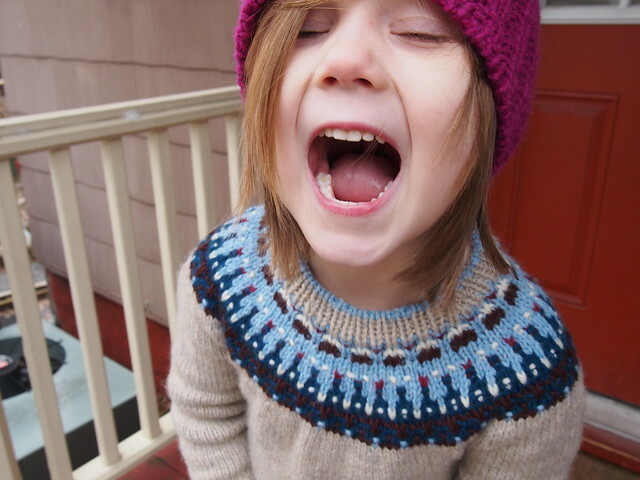 If that sweater looks familiar, it’s because I made it to match the Bohus Yoke sweater I knit for myself (9 whole years ago!). 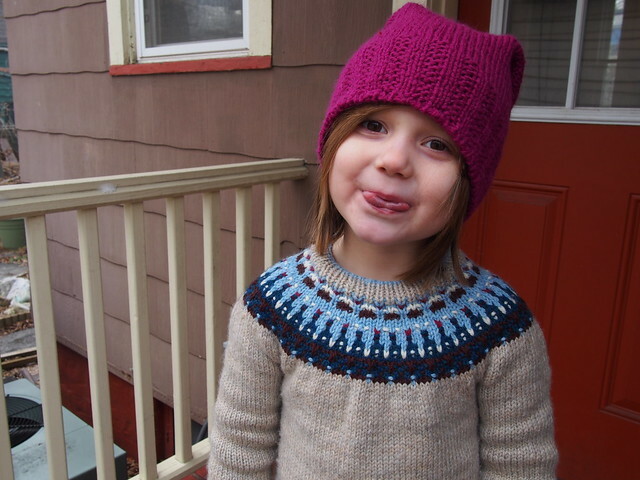 M saw me wearing it last winter, and asked if I could knit her one just like it, and it turned out that I had (more than) enough leftover yarn from the original sweater (except for the dark blue, for which I had to use a different yarn) to do just that. 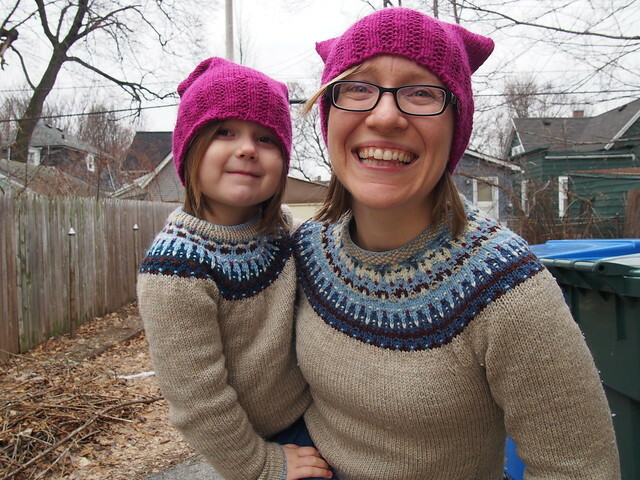 I had knit the body and sleeves last winter, but then set it aside after joining, because I’d messed up the short rows and wasn’t sure about the body length, anyway. Last week, while searching for yarn for a different project, I found the sweater-in-progress, ripped back to before the join, added an inch to the body and sleeves, and then knit the yoke, using my sweater as a guide. The yoke isn’t identical to mine, for the obvious reason that I had less space to work with, but I actually think M’s yoke looks nicer than mine! I used the same “figure out each row as I knit it” approach as I did with my own sweater, but I think I’ve gotten better at pre-envisioning how a particular motif could develop. 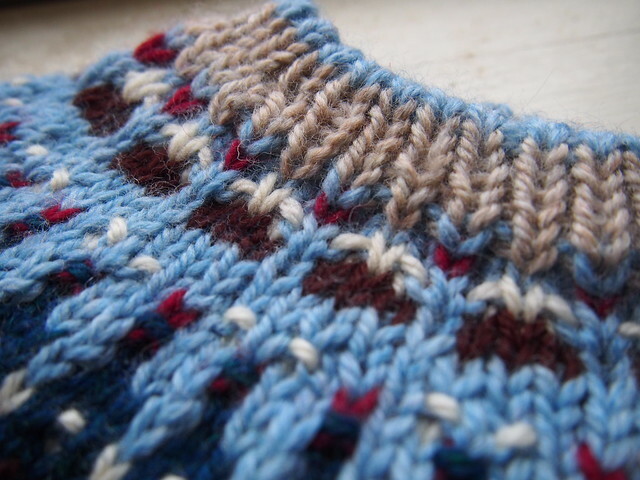 I used purl stitches and slipped stitches to play with the colors – both of these allow for a color to “appear” in a round without being knit into that round, so I never carried more than 2 yarns at a time across a round. 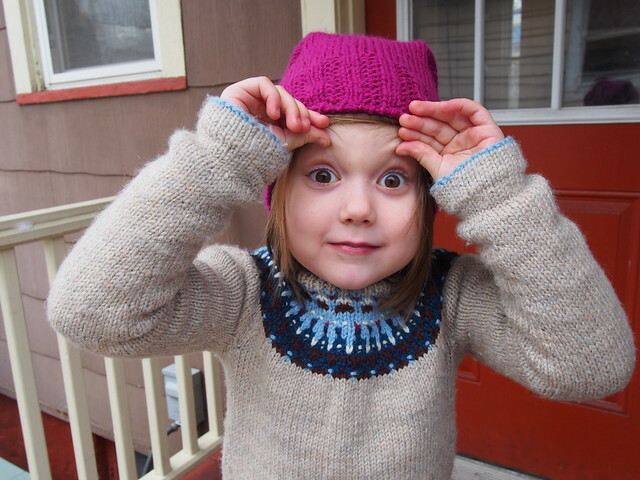 I know that M won’t want me to knit her matching things forever, so I’ll soak this up while I can! Lovely pictures and sweater, too.